In previous part 4 of this series, we have explore the transactional types of email marketing development and email marketing techniques. Now, in this part, we hope to cover the most under-utilized types of email, educational message types of email marketing. Yes, we are missing the best opportunities that can avail simply by shooting our educational emails at regular intervals to the new subscribers as well as our loyal patrons. It is true that we are highly relying on promotional types of email marketing much to acquire customers, but seldom think that simply depicting our services in such a manner that get introduction to the services you provide and those indeed help to solve the problems of many companies (B2B) and many individuals (B2C) alike. Since the educational types of emails need in-depth and the most relevant type of content, we create a layout that represent the snippets of the real content located on the web using its links. We also add the most relevant image that truly represent the message of the linked content. Finally, we give heading and taglines to those content blocks in effective manners using the most appropriate keywords. 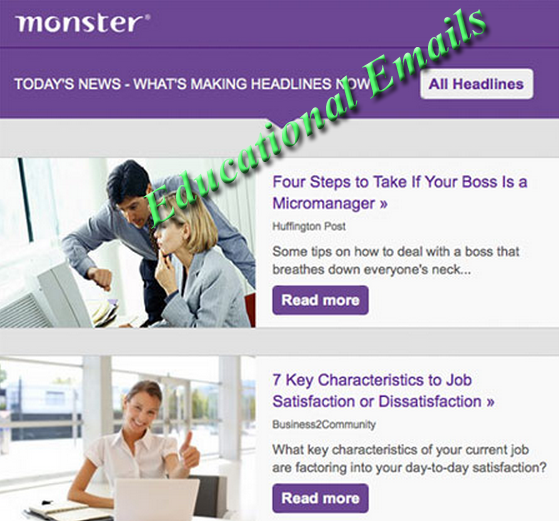 Check our image of Monster’e educational emails. We create relevancy of your services that can solve the problems of readers carefully with your content like articles, blogs, white papers, infographics, or specially made educational materials on the web for your company/brand such as video, free webinars, presentations, etc. Since we have space limitations in emails, we design in compact manners and keep content intuitive and triggering interests through bit-sized info. Thus, we force reader to click the link or button to get more info from your original content located on the web. No doubt, we add mini-promotions in educational emails, but take care to keep it subtle and unfocused through designing and content depicting techniques. Email designers at Lujayn can design such educational emails for before sale or after sale purposes too. We know how to educate visitors before launching a product and after launch. We also can design services and maintenance or product usage education emails for our patrons with latest HTML5, CSS, and advance scripts. Our ways of delivering educational email messages are distraction free and entice readers to click emails from the inbox to reach at the given links.